This blog post is part of a paid SocialMoms and Paramount Pictures blogging program. The opinions and ideas expressed here are my own. My first recollection of the Teenage Mutant Ninja Turtles was from the mid to late 80s when it came out in the comic books. I remember it being hugely popular, followed by action figures and TV shows. Seemed every kid was dressed up as at Teenage Mutant Ninja Turtle one Halloween. I will have to admit, I was already well into my adulthood when it was the peak of its popularity, so I really didn’t know much about it. Now that I have kids of my own and work with school age kids, I like to keep up with what is “in” with kids today, so when I was asked to share about the new Teenage Mutant Ninja Turtles movie, I jumped at the opportunity to write this sponsored post. Teenage Mutant Ninja Turtles is scheduled to be released in theaters and RealD on August 8th with a rating of PG-13. As typical, the Teenage Mutant Ninja Turtles are needed to save the city. In the movie, Shredder and his evil Foot Clan have corrupted New York City. Everyone from the police to politicians are in the clan’s grasp and the future doesn’t look pretty. That is until four unlikely outcast brothers step up from the sewers to ascertain their destiny as Teenage Mutant Ninja Turtles. Working with a fearless reporter, April O’Neil (played by Megan Fox) and her cameraman, Vern Fenwick (will Arnett), they devise a plan to save their city from Shredder’s evil plans. These four unlikely characters are based on Teenage Mutant Ninja Turtles characters created by Peter Laird and Kevin Eastman have to pull together, using not only martial arts skills of honor, discipline and perseverance, but the must work together as a team. I watched the trailer (as seen below) and was really surprised. It is not like the Teenage Mutant Ninja Turtles I remember seeing on television. This film looks action-packed and intense at times, and humorous and light-hearted at others. The cinematography is high quality and looks amazingly real. I like that the Teenage Mutant Ninja Turtles are willing to stand up and fight for what is good and right as it sends an excellent message to young people. This movie, though, looks to be great for older children and adults. 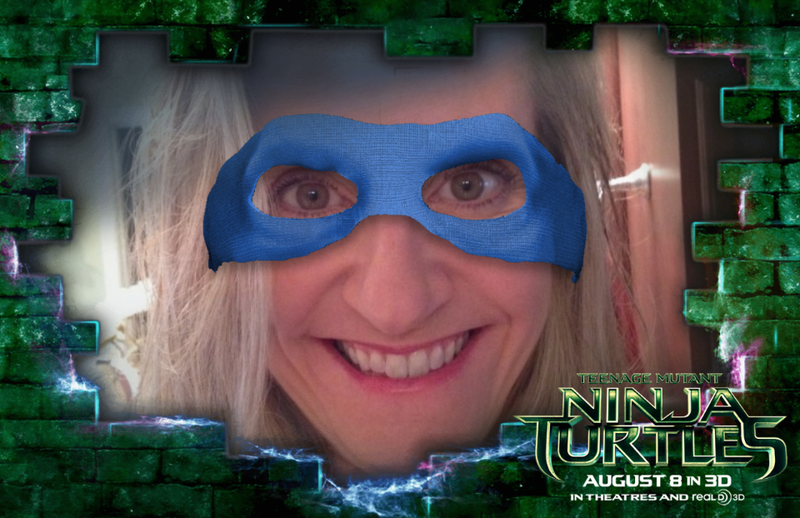 Their website is also fun—you may want to show it to your kids as they have a quiz to discover which Teenage Mutant Ninja Turtle you are most like as well as a TMNT Yourself where you can upload your photo. I couldn’t resist! What do you think? Other cast members for the film include: William Fichtner, K. Todd Freeman, Danny Woodburn, Noel Fisher, Jeremy Howard, Pete Ploszek, and Alan Ritchson, Minae Noji. Disclosure: This blog post is part of a paid SocialMoms and Paramount Pictures blogging program.